When I was a kid I remember traveling to Springfield, Illinois for vacation. My sister Debbie and I stayed with my grandfather one summer and went to a family reunion where we fed the ducks and geese in this historic park. Today I took a walk with my daughter and she too fed the ducks with left over bread crumbs. One beautiful, but greedy Mallard gobbled up most of the leavings. We stopped at this site that was only constructed in 2010. 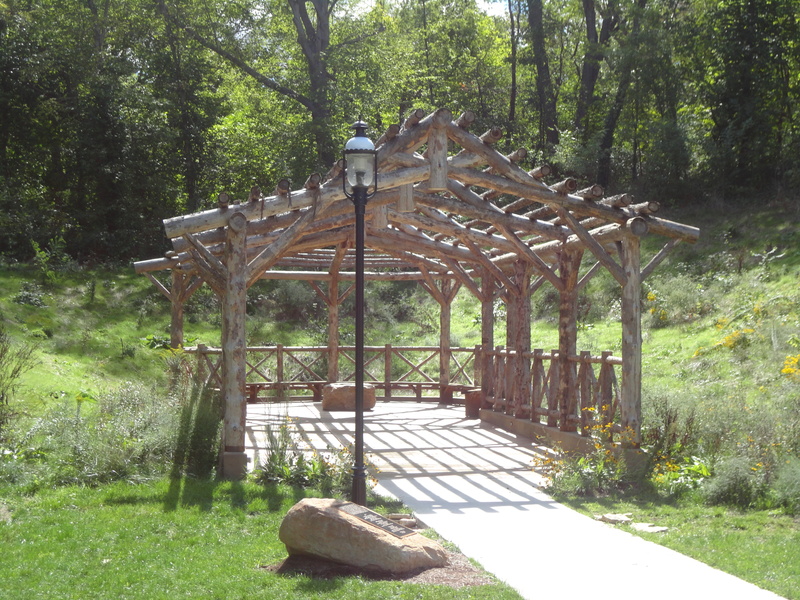 The pergola and Iron Spring was restored in honor of Otto Wenneborg by his daughter. The rock out front of the site shared that he thought the spring offered restorative and healthy benefits from the iron and mineral mix. At one time, the water had been kept on tap at the once famous, but now gone, Leland Hotel because of belief that it was beneficial for its cure of rheumatism, gout, and indigestion. How beautifully stated and how apt for this beautiful fall day where I too marveled at the beauty through the eyes of an adult and the memories of a child!